Want the True Story of Volty McNutt? One day while out exploring the galaxy RD-22 and 3CPU saw on their screen that they were coming up to the planet Firstovia. As soon as RD-22 saw this, he wanted to land the ship so he could go visit his 2nd cousin on his Mom’s side twice removed for a quick family reunion. While they were looking for the apartment that RD’s cousin lived in, 3CPU realized that he had no idea who this cousin was or what he did in life. RD told 3CPU that his cousin’s name is Volty and he spent most of his time on a planet called Earth and was the mascot for a FIRST robotics team there. The team’s number is 1557 and its name is 12VoltBolt. RD also went on to explain that his cousin was a professional storyteller at a local library before he found his calling of being a mascot. He does sometimes revert to his old ways whenever new members join the team. He tells them all about the team and what exactly they will get out of the program if they decide to come back for the season. 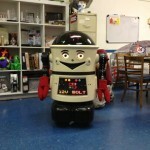 You can also track Volty’s travel bug on the Geocaching site, or visit his Facebook page.